April 4, 2013 Just A Scrappin' Challenge is Ready to feel the sun? 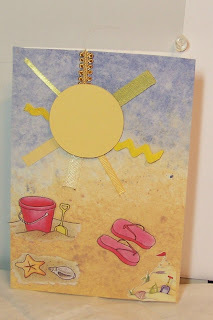 Make a card, LO or project with the sun on it. 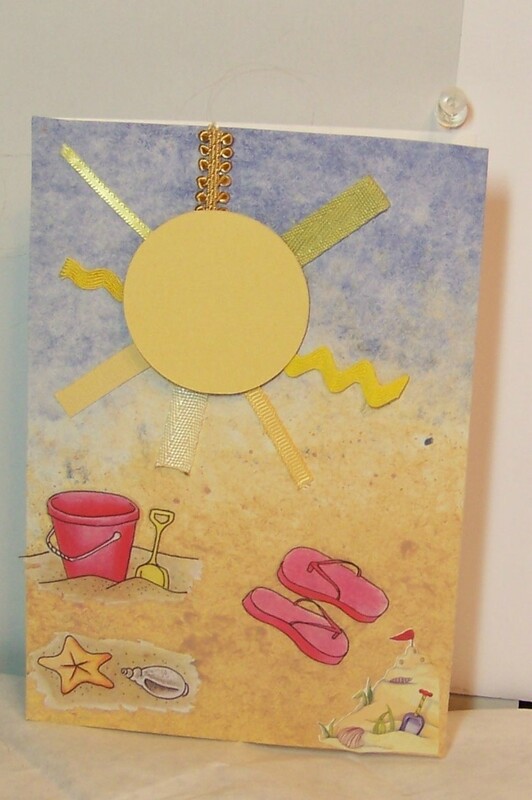 Sun on the beach card here. I remembered lots of past vacations with the sun on the beach because of this challenge. I cut 1 <circle1> at 2 inch with Art Philosophy. Using different yellow ribbons cut rays for my sun and put on the beach paper adding stickers for the usual things found on the beach. All ribbon, paper, stickers and card stock is from my stash. Have some fun in the sun and come join us at Just A Scrappin'! Did you make the background paper? This is definitely reminding me of the beach and how I want to go somewhere tropical! Awesome card! Love the ribbon rays you created for your sun! That is so clever! Lovely. I really like the beach background paper. Love your gorgeous scene! What a clever idea with the Sun Rays! Enjoy your week!